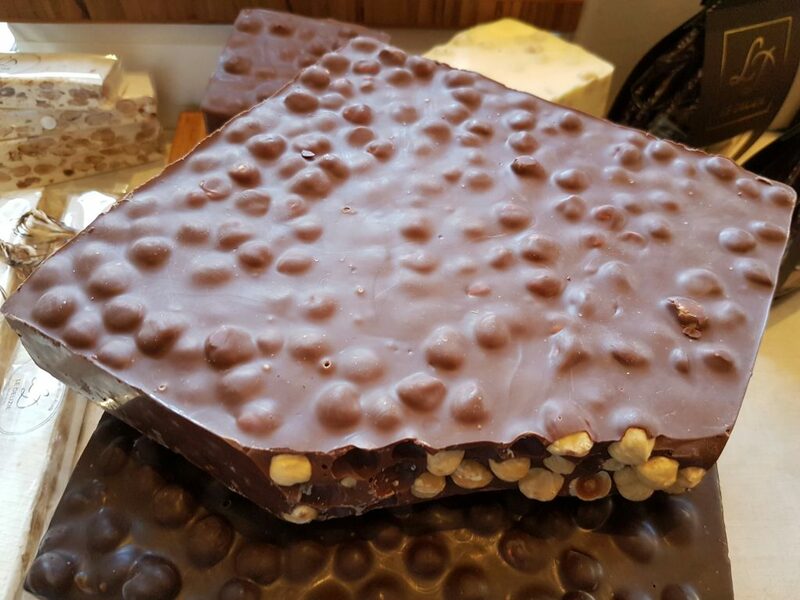 If old man Wonka had set up shop a little later in life, and a touch further south of the equator, he might just have plied his wares at the 2016 Winelands Chocolate Festival at Blaauwklippen Wine Estate in Stellenbosch this weekend (20 and 21 August 2016). His everlasting gobstoppers would’ve been given a good run for their money, though. This affair is no ordinary stroll down the supermarket sweets aisle. 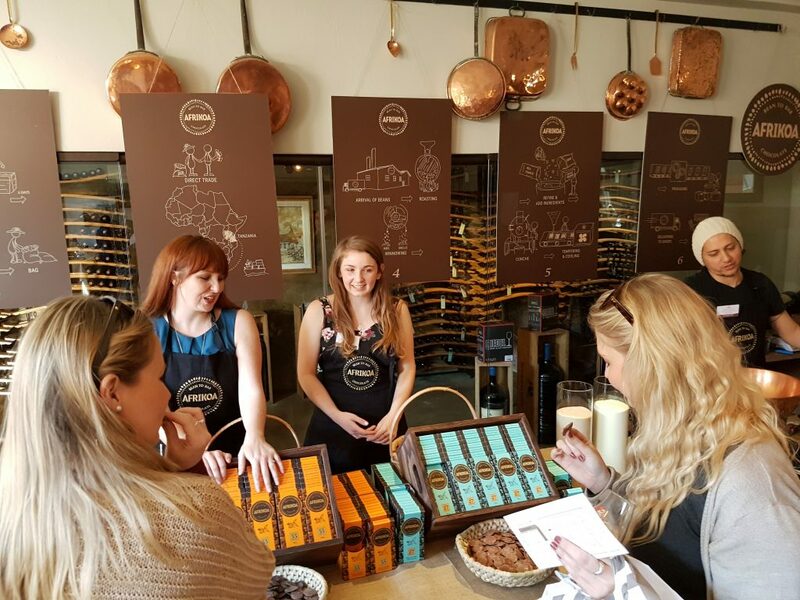 South African chocolate manufacturers, producers, bakers, creators and aficionados have put on a spread that proves just how inventive our countrymen can be when faced with raw cocoa beans and pure imagination. While there are savoury treats and food trucks ready to serve you something hot and filling, I arrived with an empty bag and emptier stomach, with only one item on the menu for starters, mains and dessert: chocolate. Breakfast, lunch or dinner. Snacks, midnight feasts or sneaky office drawer delights. In my book, there are really three things you can never have enough of: chocolate, money and bandwidth. I was here to stock up on a lifetime supply of the first, made by the some of the best producers under the African sun. Cluttered together around makeshift tables (I wasn’t paying attention to furnishings), purveyors of cocoa fill the Chocolate Emporium. Inside the darkened, melt-proof building, you’re able to mix with other tourists on this sugar safari, eyes widen open at everything around them, searching for just the right blend of flavours. White chocolate and caramelised strawberry bark? Head over to Cocoa Fair and sample some of their chocolate shavings. Their overgrown triple bullion bars could’ve fitted in my bag (and my fridge) if no one was looking. Maybe next year. Too sweet (#crazytalk) for you? Rococoa‘s salted chilli dark chocolate pizza (a big round piece of bark) is heaven sent for TV watching. Or bus riding. Or picnicking. Or the drive home after buying it. You know, as one does. Italian hazelnuts enrobed in massive chunks of milk or dark chocolate? An undisturbed tree trunk of nougat, just waiting for your teethmarks? Coming right up at Le Delizie. Not cheap by any means, but how else could you wallow elbow-deep in the true luscious nature of beautiful ingredients and scrumptious chocolate? Worth surrendering a limb for, let alone a few extra Randelas. Cassis Paris was there too. Calories be damned at this point, I shoved a decadent mini (hardly) black forest cake and another sugar-dusted French dessert into my bag. OK fine: bags, plural, if you must know. 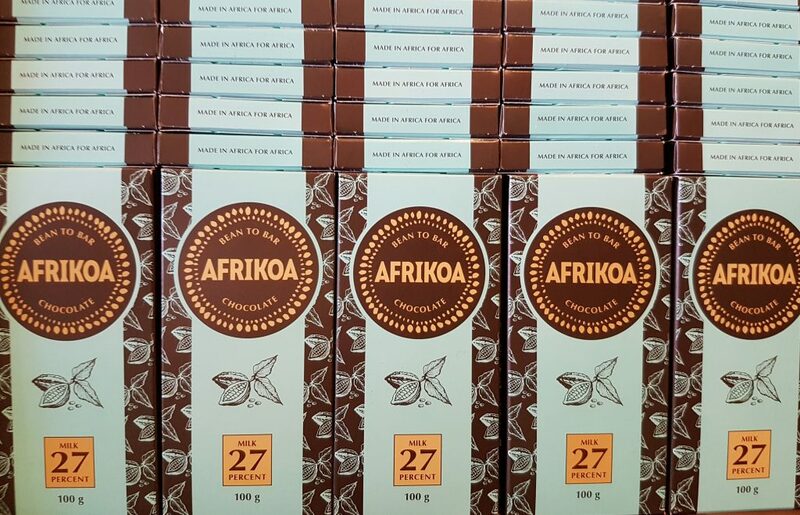 One of the most exciting discoveries of the day was sampling Afrikoa‘s chocolate range for the first time. These guys scour the continent for the best cocoa money can buy, then transform their haul into chocolate bars as quickly as they can. 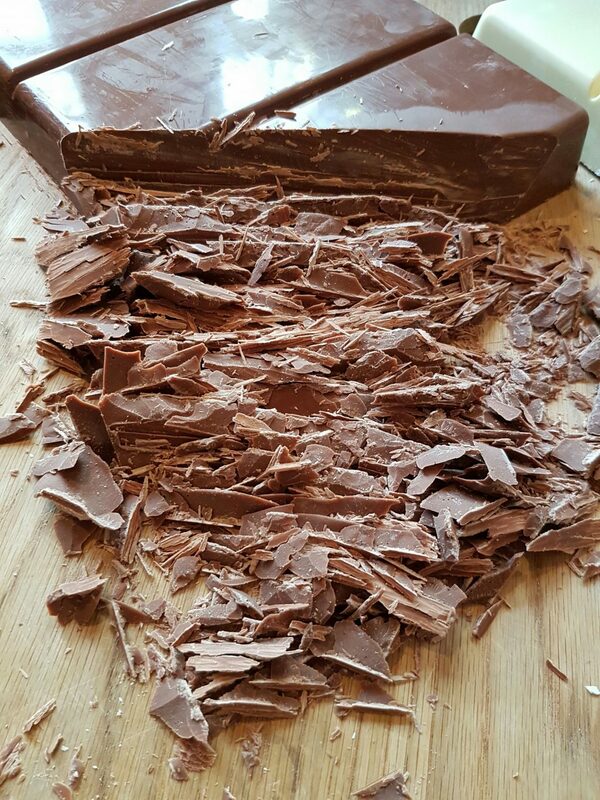 This gives the chocolate a noticeably different, fresher, purer flavour that’s moreish not just because your serotonin levels are exploding, but because you’re actually tasting all the ingredients. The 70% isn’t just bitter, it’s palpably fruity, and melts in your mouth before you’re able to remind yourself that you’re in public, compose yourself and pay for it. I obviously had to grab a few different bars. I snatched up a 27% milk chocolate slab, a 55% semi-sweet and 70% dark. But I also added a bit more weight to my straining packets with a 500g bag of 27% buttons. They’ll be easier to melt for baking, and I have just the right recipe in mind that needs a little less sweetening than ordinary milk chocolate would provide. Cranking up the oven as we speak. On the way out, a pastel green gelato cart with glistening golden domes caught my eye. Before I knew it, I was swirling some of Moro‘s frozen creations around my mouth and chatting about lazy afternoons in Milano with Stefano, a fascinating gent in charge of the scoop. Tastings and musings dispensed with, I left with two takeaway boxes filled with some of the smoothest pistachio gelato I’ve ever tasted. Cosied up next to it was another flavour: a mix of mascarpone, cocoa (think artisinal Nutella) and hazelnut. How these are going survive the weekend in my freezer is beyond all rational thought. After a few more cheeky purchases from some of the other bustling stalls, I almost broke into a full-on skip while walking back to the car. My head was spinning at the quantity and quality under one roof, while my taste buds were charging around, ready to mutiny any second. Luckily, I managed to calm the troops with a white chocolate fudge bar from Ma Mere. There are loads more events and attractions on offer this weekend, including an abundance of wine and spirits to pair with your chocolate cache. If anyone needs me for the next 7-10 days, I’ll be at home in a confectionary coma, dreaming of sweet nothings while ensconced in sweet everythings.